Transition from an old identity associated with the previous organization (MetroVision) and establish a new brand for GNO, Inc. that positioned the organization as a dynamic, credible, resourceful and effective. 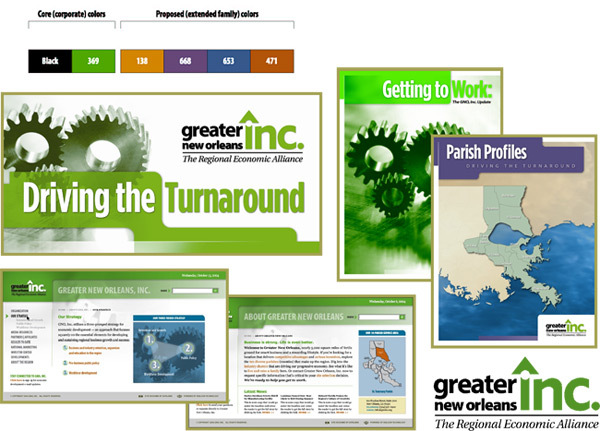 A public/private partnership formed in January 2004 to spearhead economic development for the ten-parish Greater New Orleans region by creating 30,000 jobs in five years. Lead executive staff and internal stakeholders through an identity audit. Establish brand characteristics and corresponding taglines. Direct development of collateral material for segmented communications strategy. Manage process for website content development and design. Develop electronic communications tool kit for consistent use of identity collateral. Train staff on application of materials and tenants of new brand.